Video game publisher and developer Mastiff recently revealed four new titles at an exclusive off-site press-only event during the Game Developer Conference in San Francisco. Among the newly announced titles was Heavy Fire: Red Shadow, the next action-packed installment in the Heavy Fire series. Today, Mastiff is excited to share details regarding Heavy Fire: Red Shadow’s martial story. In Heavy Fire: Red Shadow players lace themselves up in the tattered combat boots of Sgt. Will, who narrowly survived a North Korean missile attack on Guam and now finds himself almost single handedly trying to repulse an enemy beach landing. As Sgt. Will, step onto the unforgiving battlefield, establish a beachhead, and holdfast behind a turret-mounted machine gun. A brutal and unceasing onslaught of enemy forces will attempt to flank and eliminate Sgt. Will from every angle as he and a few surviving comrades rain hell upon anything that crosses their iron-sights. Set in the not-so-distant future, tension between a bold North Korea that has managed to establish a unification with South Korea entirely on its terms and the United States have gone beyond their breaking point. Feeling threatened by North Korean nuclear weapons and not seeing a diplomatic solution, the US launches a series of bombing runs from Guam on North Korea’s missile launch and manufacturing facilities. North Korea retaliates with a plan as simple as it is audacious: use reflagged South Korean naval vessels to launch a raid on Guam, attacking, looting, scoring a PR victory and then leaving before US reinforcements can arrive. A brilliant plan that is up to Sgt. Will to stop. 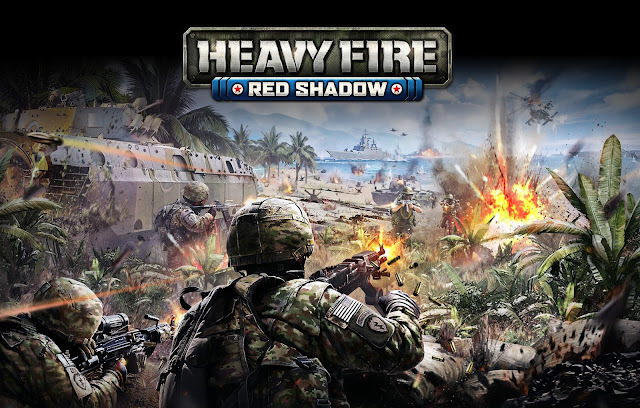 Heavy Fire: Red Shadow will be released Summer 2018 on the Microsoft Xbox One entertainment system, the PlayStation®4 computer entertainment system from Sony, PS VR for PS4™ system, and Steam for Windows PC. Fans excited for the upcoming release can visit www.heavyfireredshadow.com for key information, video, screenshots, and more.